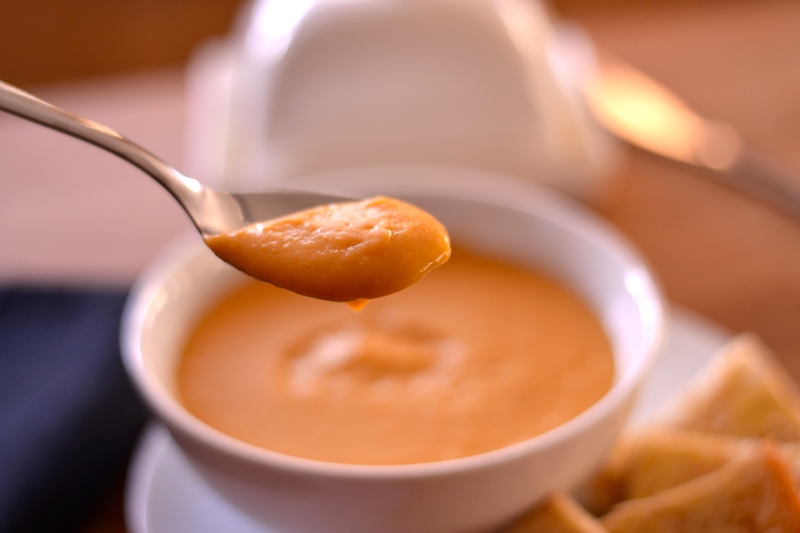 Roasted Butternut Squash Soup – Warming, healthy and delicious, without the need to cut up a squash! To me, soup is one of those dishes that I could not be without. It’s a life saver. Seriously. As a busy mum, who has a penchant for the easy life, in those moments of ‘I really can’t be arsed cooking’, soup is my go-to meal. 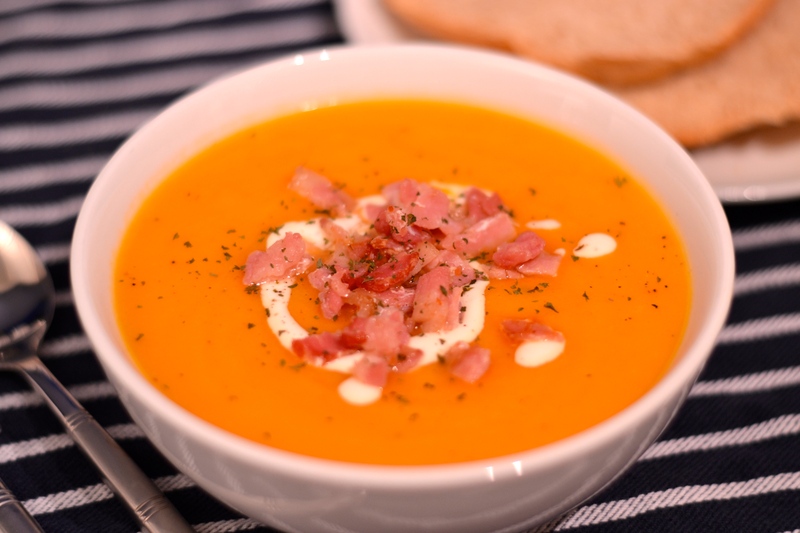 It’s quick; it’s simple; I’ve usually got some in the freezer (or a tin in the cupboard – my kids go gooey eyed over Heinz Tomato Soup, it’s a proper love affair). And the real bonus is that you actually feel like you’re giving them something healthy (maybe not so much in the case of Mr Heinz). A little bit of effort in a moment when you’ve got some energy (fleeting I know, but I’ve got to catch them when I can), and you can feel smug even when Mr Motivation has left the building (not really sure why all these different male characters are popping up). 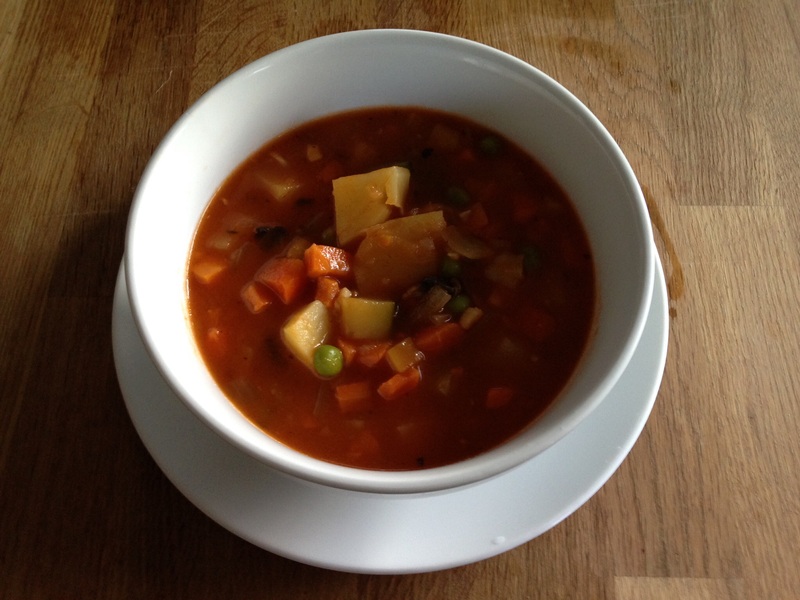 My kids favourite homemade soup is the lentil soup I’ve blogged before. But this is a good alternative (just go easy on the chilli). It has a lovely sweetness that is offset by the cumin. And the real bonus (certainly in my eyes) is that you don’t have to peel and cube a butternut squash. I think I originally found the recipe in BBC Good Food (it was a while ago and I can’t find it again). But I ended up changing it a bit as I wasn’t satisfied with the end result. I can’t be the only one who is often disappointed by soup? Too bland? No flavour? 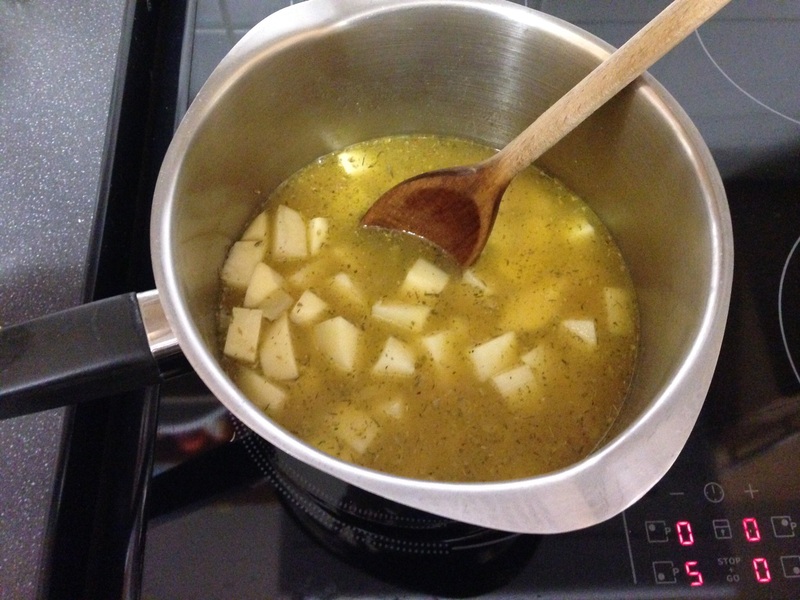 I’ve made some in the past that really haven’t cut the mustard – I once made ‘Roast Chicken Dinner Soup’. It was boggin. Never do it. 1. Pre-heat your oven to 160°C/325°F/Gas 3. 2. Cut the squash in half lengthways (you’ll need a big knife, but it’s not actually that hard; if I can do it with my puny arms I’m sure you’ll manage). Scoop out the seeds and discard (or if you’re being all Jamie Oliver you can wash them, and roast them). 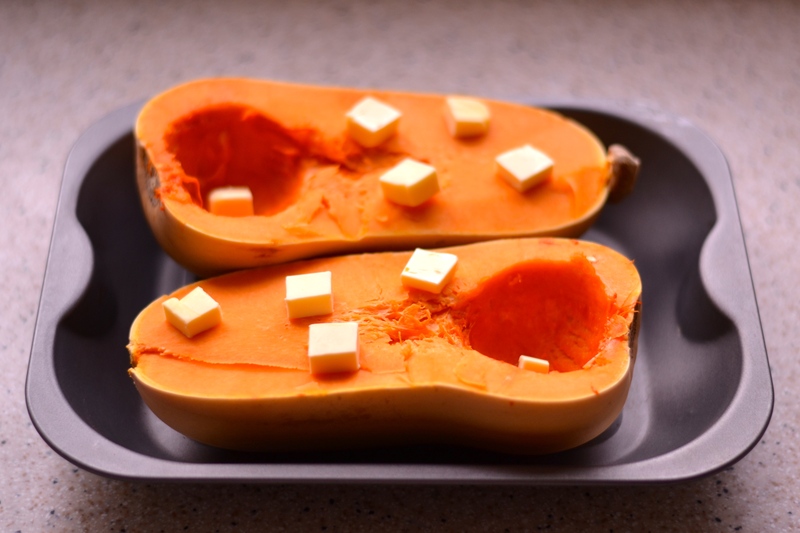 Place the squash in a roasting tin and dot it with 25g of the butter. Bake for about 1 hour until softened and caramelising. 3. 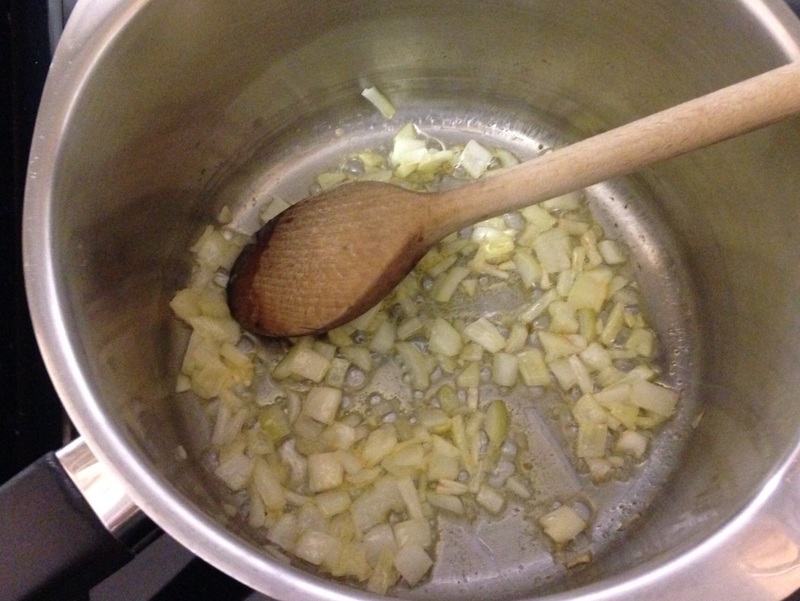 Melt the remaining butter in a large pan over a medium heat, add the onion and cook until softened and beginning to colour. I’m all about making life simpler and so tend to use frozen, diced onion a lot. It may seem is fairly lazy, but I don’t really give a monkeys as it’s a lot easier throwing in some ready chopped onion that I can have to hand in the freezer, than crying over an onion. 4. Add the garlic (I used paste), ground cumin, chilli flakes, potatoes and carrot. 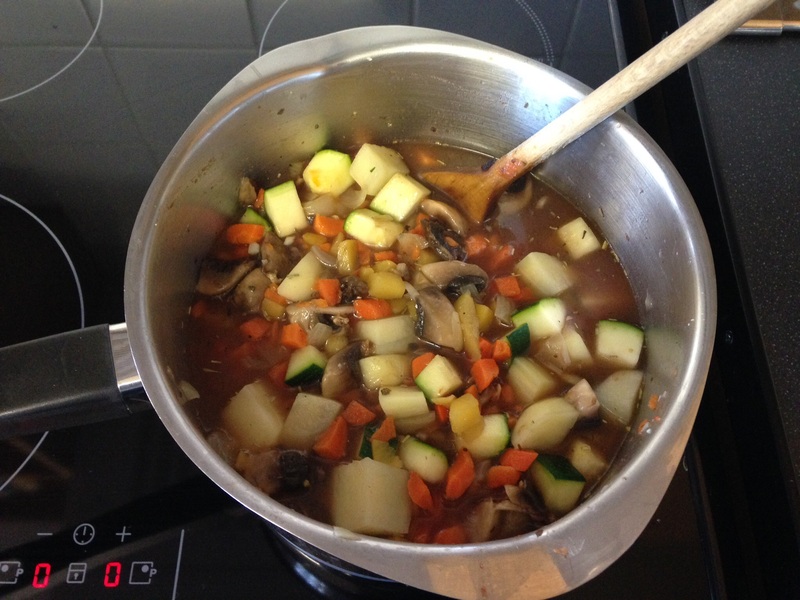 Cook for a couple of minutes then add the stock, cover the pan, and leave to simmer until the veg is soft – approx 25 minutes. Just for a bit of reference regards quantities, this was how much carrot and potato I used. 5. 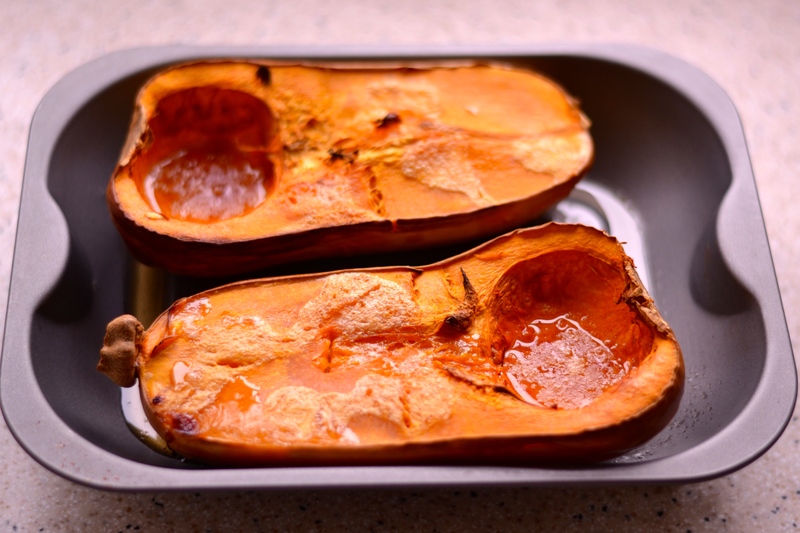 Once out of the oven, allow the squash to cool a little before scooping the flesh out of the skin and adding it to the pan of soup. 6. Liquidise the soup either using a hand blender or in a liquidiser, then taste and season as desired (it will most likely need some salt and pepper). It doesn’t really matter what kind of stock you use with this soup. I went to use vegetable stock cubes (4 Knorr stock cubes in this case) and found I didn’t actually have any, so used chicken instead. Still tastes like it should. You also don’t need to add bacon and crème fraîche, I was just trying to make the photo pretty. However, as the Husband said, ‘almost everything is better with bacon in it’. So there you go. This is a very quick post because: it’s after 8pm; I’ve just finished bedtime with the kids (alone as the Husband is working); and I’ve a hot date scheduled with Phil (& Kirsty). But I wanted to blog about this lentil soup as it’s so ridiculously quick and easy, and yet gorgeously warming and filling. 1. Throw all the ingredients into a large pan and bring to the boil. 2. Let it simmer for about 30 minutes until the veg and lentils have softened (so that you can’t see the lentils anymore) – or ask the Husband to turn off the cooker for you after 30 minutes because you have to go out; which he forgets to do; so you return, over 90 minutes later, to soup burnt to the bottom of your pan. Moving on. 3. Once it’s cooked you can either leave it lumpy or blitz it with a hand blender, or in a liquidiser. And that’s it. Job done. Lucy says hi by the way (she was desperate to get in on these photos)…. Sometimes I’ll throw some ham into this soup whilst it’s cooking, if I’ve got some leftover from a roast. 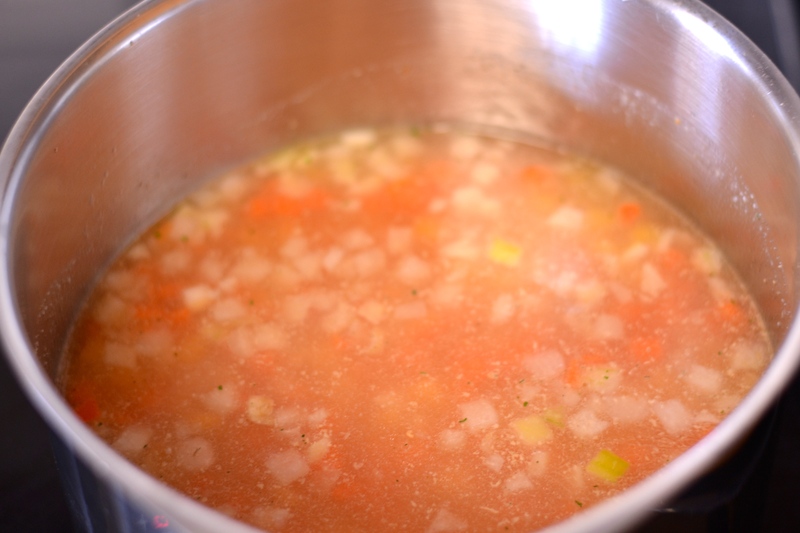 Using three stock cubes makes this soup fairly salty to start with, so taste it before you add any seasoning. It’s a pretty thick soup, but just add some more water to thin it down if you’d prefer. 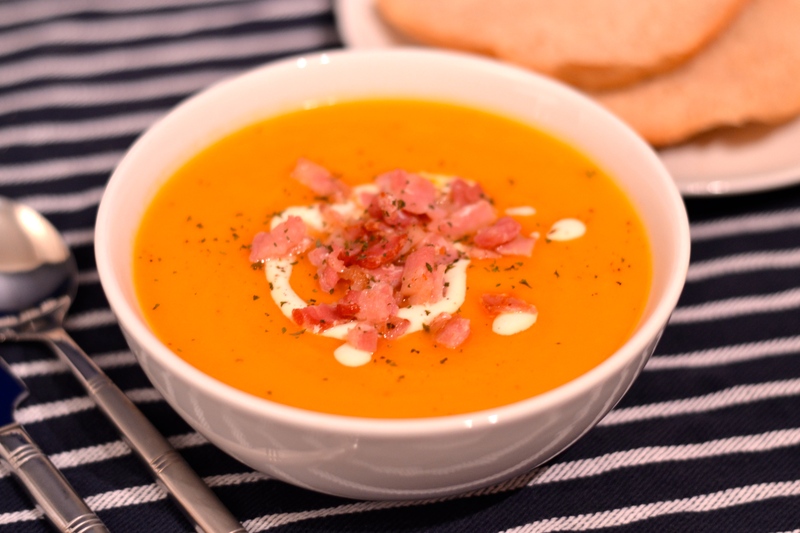 My kids absolutely love this soup, and I use it as an easy (and pretty healthy) dinner when I just can’t be arsed cooking. 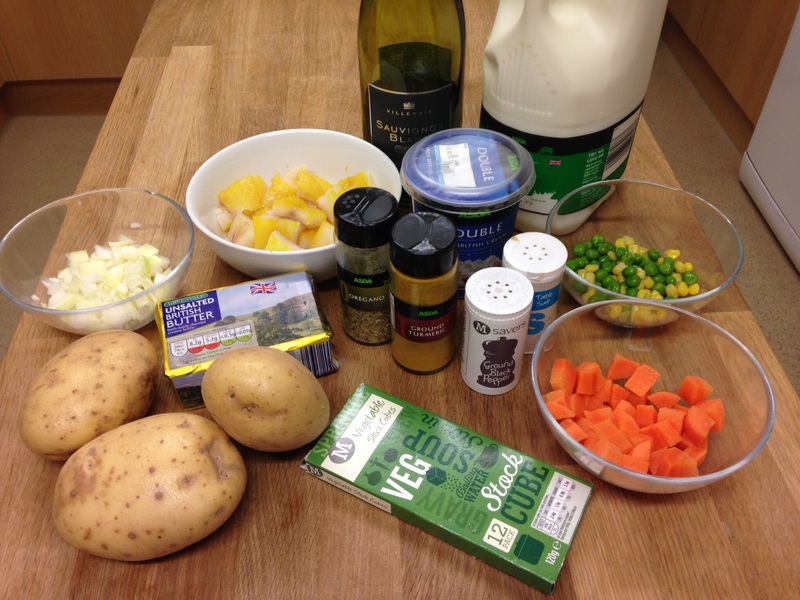 These quantities don’t make a huge amount of soup, but just double/treble the recipe as required. 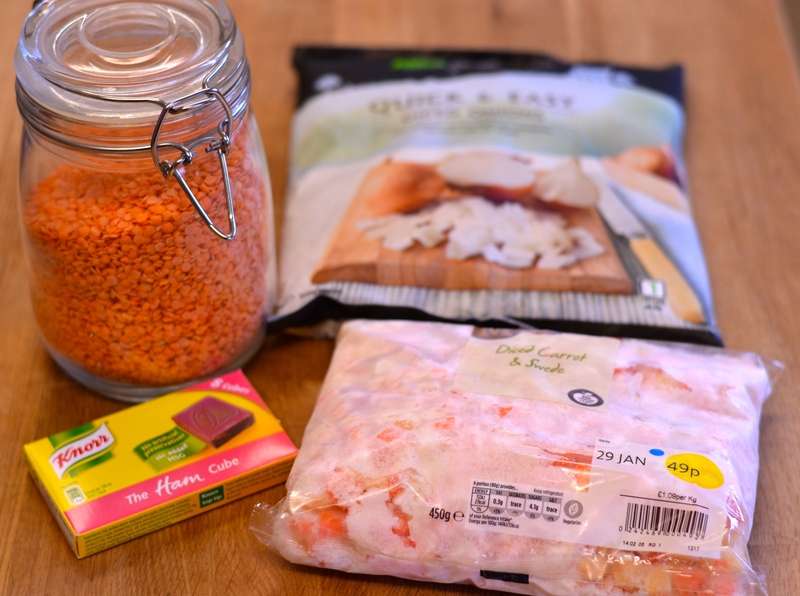 By using the frozen veg, this is such an easy option. So that’s the post! Its such a good job you can’t see me as I’m sat here in my pyjamas and the fluffiest red jumper ever, drinking tea, and eating Ferrero Rocher. Winner. I mostly have to do my grocery shopping online. Supermarkets do not, willingly, provide triple trolleys (there is such a contraption though!). And anyway, trailing 3×3 year olds around a supermarket sounds like a fate worse than death. I think I’d rather stick hot forks in my eyes. I’m eternally grateful to online shopping. I have no idea what I would have done over the last few years without it (what did folk do before it – seriously?!). But it’s not perfect. Indeed, sometimes it’s far from it. Sometimes what you think you’re ordering, isn’t actually what you’re ordering. Quantities can go majorly wrong. I’ve got a friend who managed to order her whole shop twice (in the same order). And substitutions? I think the grocery packers get bored, and fill their time with trying to make the most ridiculous substitutions – like the customer who ordered condoms, and received KY jelly (not me I may add). So when I ordered the fish for this recipe, I thought it was skinless. It looked skinless on the pitiful thumbnail sized picture they let you see. It wasn’t. So I had to cut the skin off. Which is a crap job. There really is no point to this story other than I’m having a whinge about having to de-skin a fish. Anyway, onto the recipe. This is a lovely dish. It’s a soup, but it’s also so thick and warming and lovely, it’s a whole meal in itself. This served 3 adults – ok it didn’t, because the Husband went back for seconds – but if you wanted it to serve more, simply double/treble etc the amounts. 1. Melt the butter over a low heat in a large pan, then add the onions and let them soften gently until they’re turning translucent. 2. Add the stock, wine, potatoes and herbs and bring to the boil. 3. 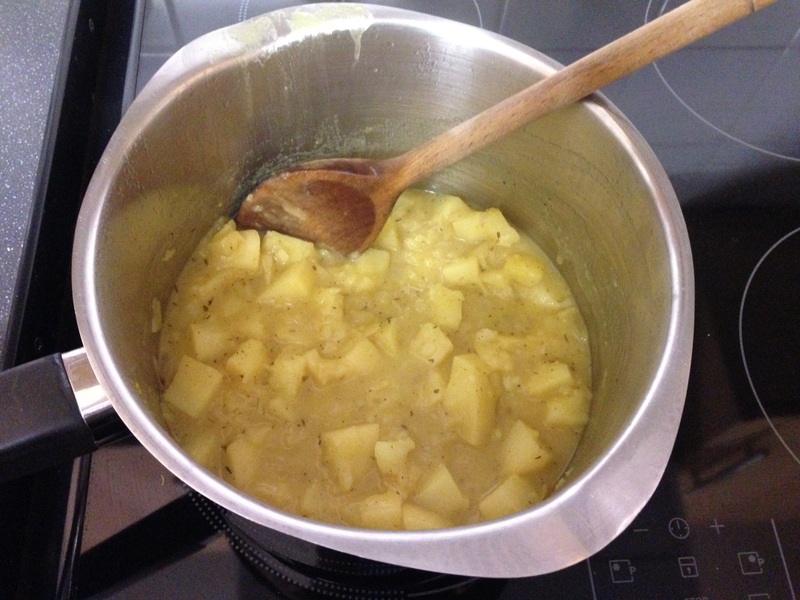 Simmer for about 15 minutes, until the potatoes are cooked, then lightly mash them but still leaving a lot cubed. 4. Add the fish, veg and milk, stir well, then leave to simmer for about 5 minutes until the fish is cooked through. 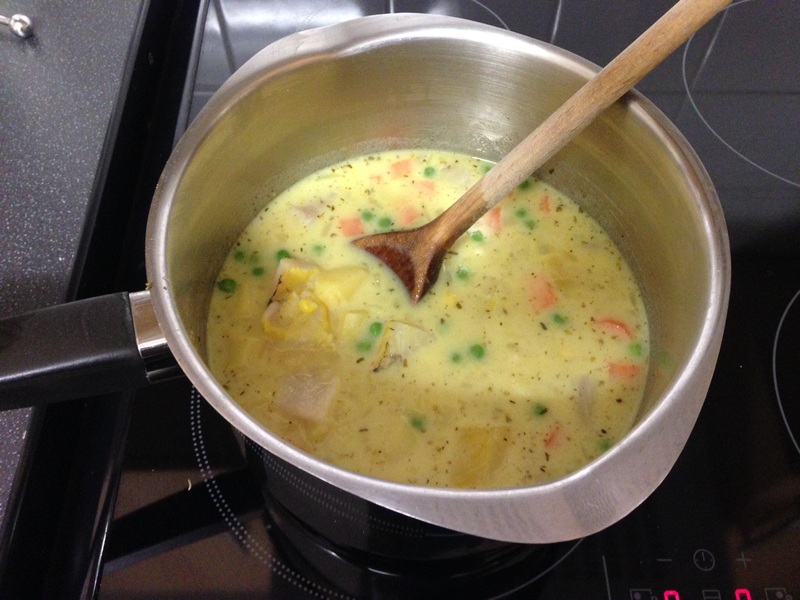 Note – I was using up veg leftovers, so my carrot, peas and sweetcorn were already cooked and I added them at this stage. 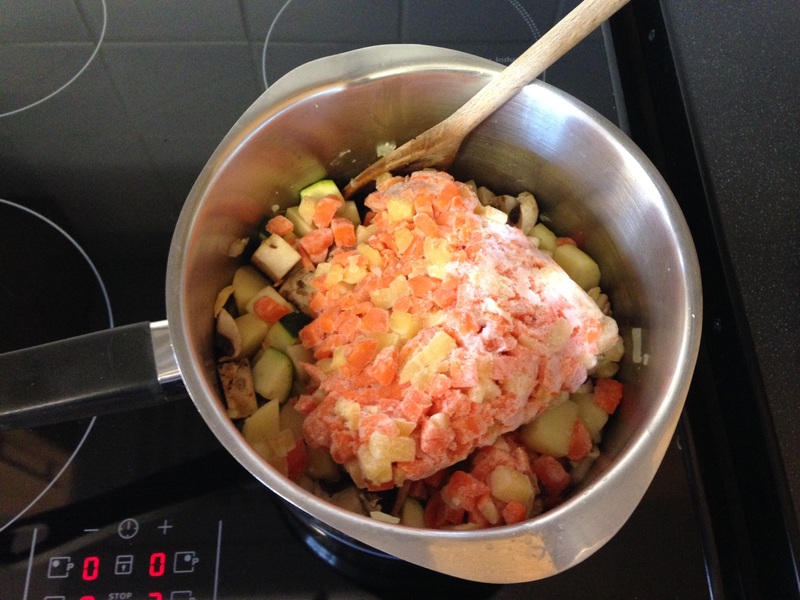 However, if you were using raw carrot, add it with the potato and cook until both are soft. Your veg choice here is completely up to you. I like the added colour of the carrots and peas, but you could just add sweetcorn if you wanted, or no veg at all. It’s completely up to you. 5. Add the cream and warm through, but do not boil (this can split the cream). Season well (taste it until you’re happy), and serve. This is lovely served with fresh, crusty bread. Like I said, it’s a whole meal in itself, and there’s just something really warming about it. It’s a cold, snowy Saturday, so a pot of soup on the stove seemed appropriate. I love soup. It’s filling, usually pretty healthy, and once it’s made, really quick to heat and consume. I really struggle at lunchtime to find time to make myself anything, so having some soup in the fridge is a bit of a lifesaver (or more a waist-saver, as otherwise I’ll reach for anything, usually crap). This soup recipe comes from my own lovely mum. She used to make this for my dad, to take with him when he went fishing. Hence, it became known as ‘Fishing Soup’, despite there being no fish involved (in either the soup or my Dad’s efforts!). You can play about with the veg you add, whatever you have/like will do. This is our version. 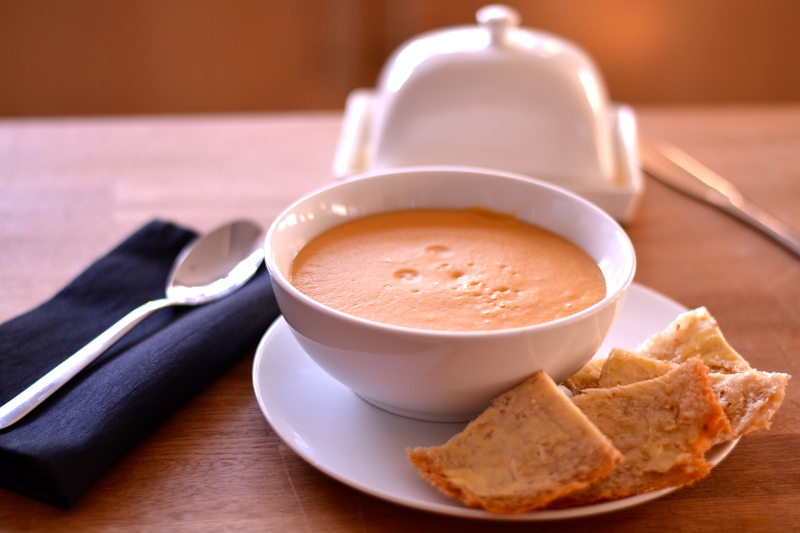 I used a ready-made pack of diced carrot/turnip I’d previously frozen – these are great for soups and I use them all the time. I read somewhere that you should blanch fresh veg before you freeze it. This is way too much work for me, so I don’t bother. I really only use veg like this for soups/stews, so it hasn’t proven a problem. There looks to be a lot of ingredients there, but I didn’t have any mixed herbs – which is made up of basil, oregano, rosemary, sage, thyme and marjoram – so I added a smidge of each herb instead (except marjoram which I’ve never used, and in all honesty am not even sure what it is??). Heat the oil, add the onion and soften, then add the garlic for a couple of minutes. Add all of the veg, except the peas. I had to give the carrot/turnip mix a good bashing to separate. Cook this over a medium heat for about 5 minutes, stirring often. Add the puree, stock and herbs. Simmer this with the lid on for about 30 minutes until all of the veg is soft. 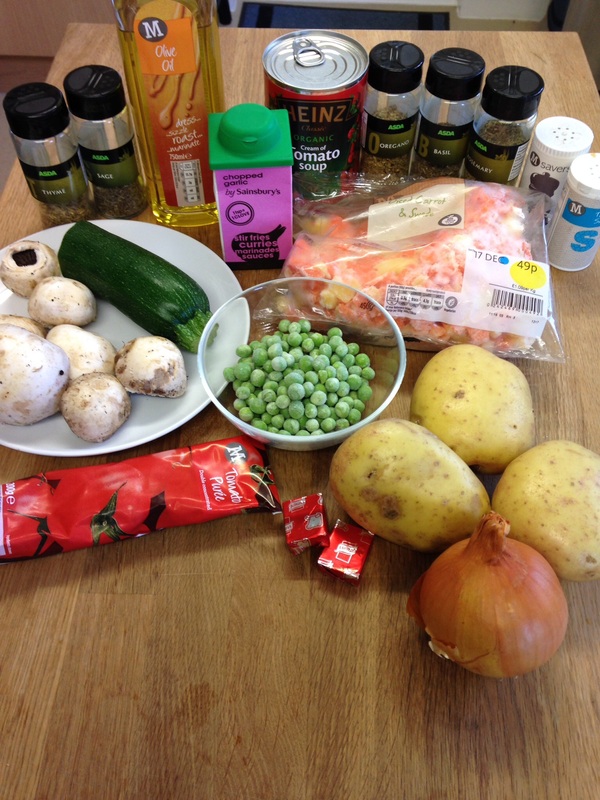 Add the peas, and then the tomato soup – I realise it might seem a bit odd, adding soup to soup, but this gives it a creaminess which is lovely. Have a taste and season as required (mine only needed a wee bit of salt and pepper).